The FSA is headed by the Executive Director. The day-to-day business of the administration and management, together with the supervisory duties of the FSA, fall within this portfolio. The statutory duties of the Executive Director are outlined in the Financial Services Authority Act, The Registered Agent and Trustee Licensing Act, the International Business Companies Act, the International Banks Act, the International Trusts Act, the Mutual Funds Act, and the International Insurance Act. 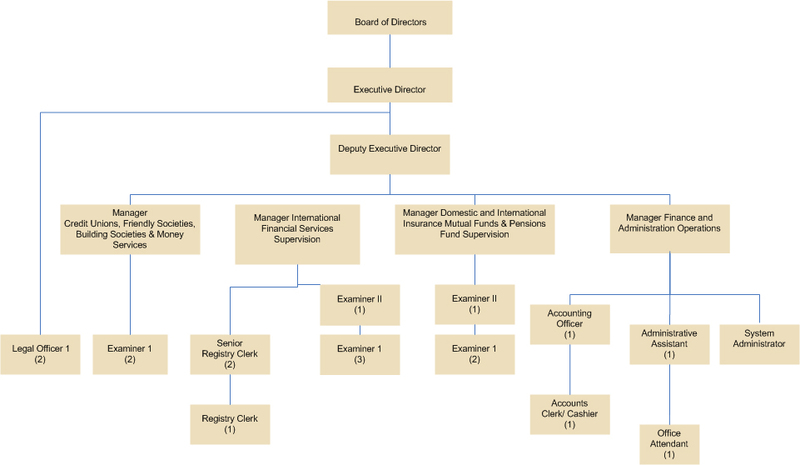 The organizational structure of the FSA consists of the Board of Directors at the top, followed by the Executive Director, then the Deputy Executive Director and the divisional managers on the fourth tier. FSA is appropriately resourced and staffed with a cadre of skilled and trained professionals. Each technical department implements programmes and policies aimed at ensuring compliance through surveillance, supervision and inspection of regulated entities in line with regulatory requirements and the chosen model of supervision.